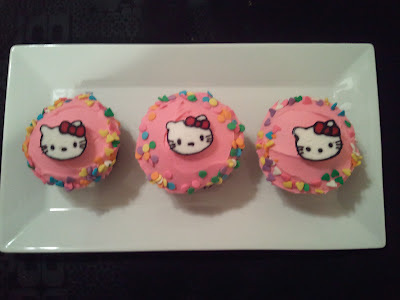 Is there anything more perfect for a 5 year old's birthday party than Hello Kitty Cupcakes? Bake your favorite cupcakes and set aside to cool. We did Yellow and Devil's Food Cake. Next, mix your frosting with the desired colors. Birthday girl's favorite colors were purple and pink. Once cupcakes are cool, Frost! And roll sides in colorful sprinkles! Easiest way to do this is make a mountain of sprinkles and roll the edge of the cupcake so that it is coated in sprinkles. Now the next part is a bit tricky. Find the image that you want to use. For Example, I chose this Hello Kitty image. Then you will need to flip the image. This is especially important if you are using this technique for lettering so that it comes out right. Since I wanted the bow on the right, I flipped the image so that the bow is on the LEFT. 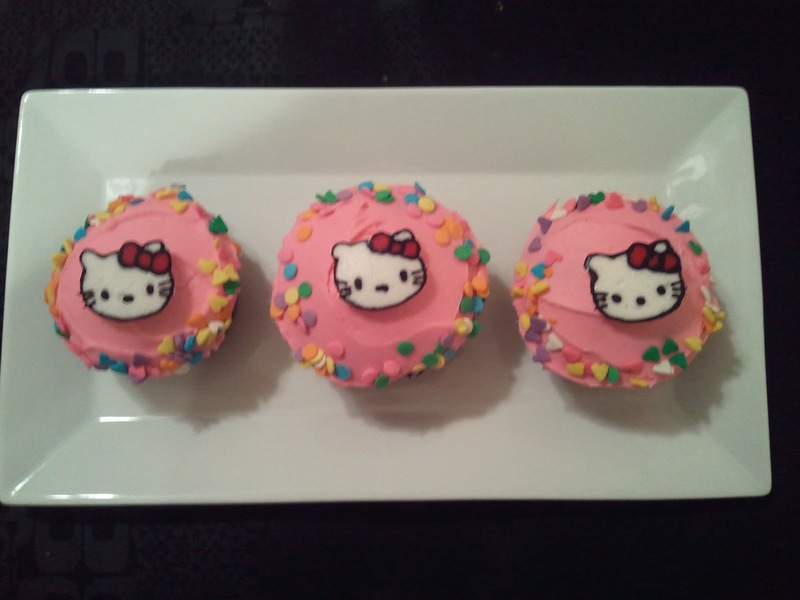 Print out your image in the size that you want for your cupcake toppers. Print a few extra copies in case you get frosting on some! Next, put your colored frostings in bags with Wilton tips at the end. My 3 colors were Black, Red and White. I used a size #2, #7 and #12 for this. I used the #2 tip for the Black, #7 tip for the Red and #12 tip for the White. 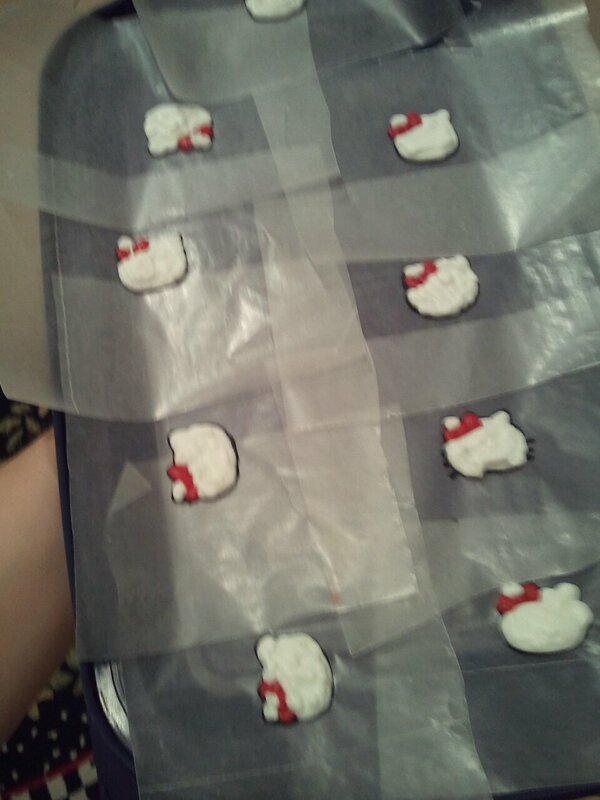 Place your reverse image underneath some wax paper and start outlining! First, I outlined all of the black except the whiskers. (I found that the whiskers became very brittle and I wound up piping these on after the Hello Kitties were put on the cupcakes) Next, color in the bow in red. 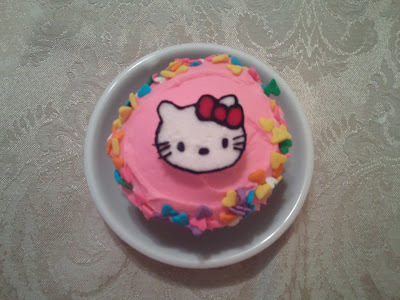 Lastly, fill the entire hello kitty with the white. Try to stay within the black outline. Stick them in the freezer! Wait until they are hard and easy to peel of wax paper. Peel them off, flip them over and place them in the center of your cupcakes!